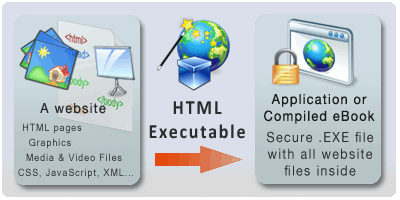 With HTML Executable, transform your website, ebook in HTML or PDF format, course, documentation or any website into a stand-alone and secure desktop application (one EXE file for Windows). Generated ebooks work with online activation: after purchase of your ebook, customers can activate the ebook thanks to an activation code on a given number of computers only. Moreover, you can control who may read your ebook, block access at any time and authorize refunds to your customers. Everything is automated thanks to Protect Ebook.net. How does online activation work? 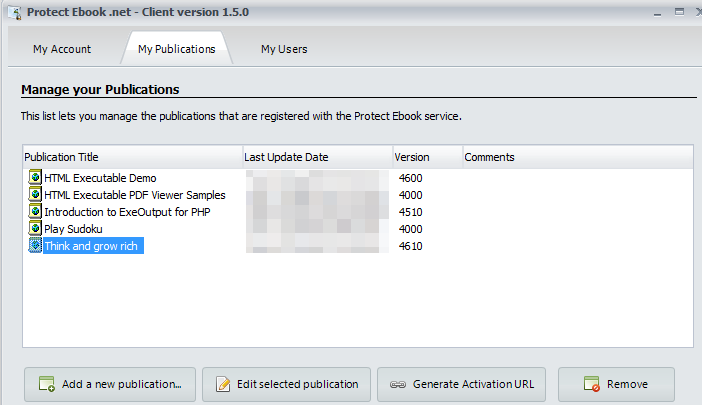 When the end user enters his activation code into the program, Protect Ebook.net checks whether the ebook can be activated or not. Thus, you can remotely control who can activate and unlock registered editions of your ebooks. 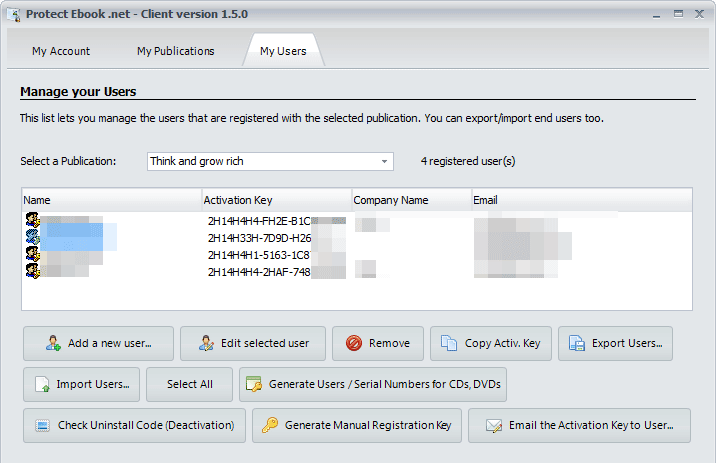 Moreover, activation ensures that end users can only activate their key on a given number of computers, and that users who got a refund cannot access the publication anymore. 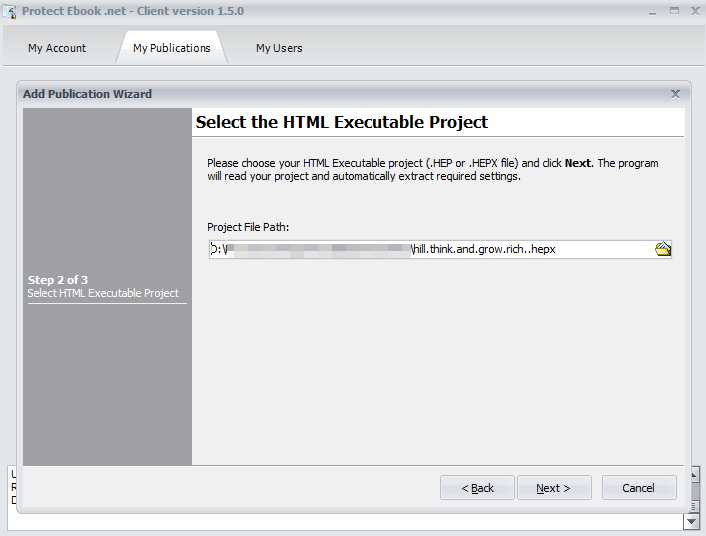 In all cases, you decide what should happen thanks to all versatile options provided by Protect Ebook.net and HTML Executable. You manage your ebooks and customers with a real and responsive Windows application that can be run from any computer with Windows. This application is called the Protect Ebook Client. Sell your ebooks with PayPal, FastSpring, E-junkie, WooCommerce... Protect Ebook.net has full support for these shopping carts and resellers. 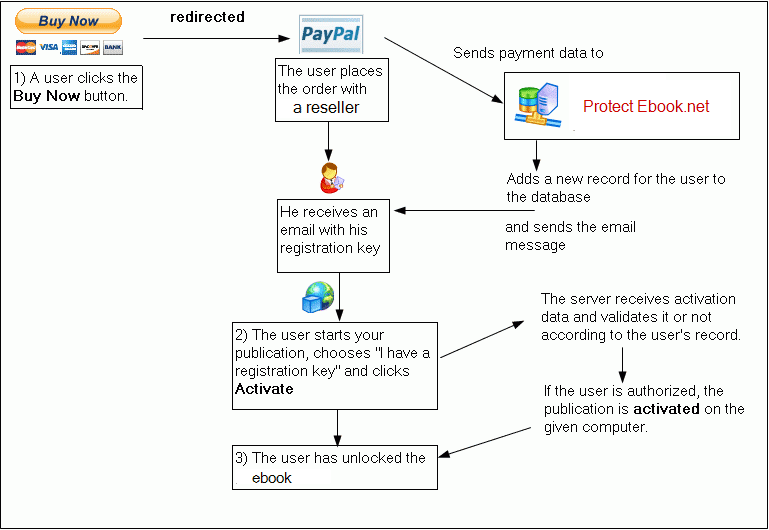 Protect-ebook.net can deliver activation keys immediately after purchase to your customers for you.